Middle Speed : 2900RPM. 80x80x25mm, Ball Bearing. SUNON DC FAN. SUNON made in Taiwan. Net weight approx : 85g, 1pc. CE TUV UL safety. Hope you can understand. For example 3 . 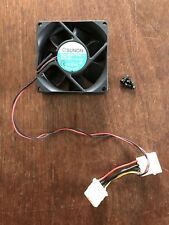 This item is a used 80mm computer case fan with a 4-pin connector, manufactured by SUNON. Middle Speed : 2900RPM. 80x80x25mm, Ball Bearing. SUNON DC FAN. SUNON made in Taiwan. CE TUV UL safety. Hope you can understand. For example 3 For example 2 . There are two 24 volt 80 mm. fans, 2.4W model KDE2408PTS3-6 and one 12 volt 80 mm. fan 1.6W model KD1208PTS3. Manufacturer SUNON. Fan type DC. Fan kind axial. Connector Choice3 wire 3 pin. Current and power consumption tolerance±15%. Rotational rate/speed3200 (±10%)rpm. Signal outputF type. Bearing typeball bearing. New Sunon 80 mm x 25mm server grade 12V DC fan with 2 ball bearings (model # KD1208PTB1 ). Pretty quiet & moves a good amount of air at full speed. Bearing: Dual Ball. Power Connector: 4 pin. Noise Level: 35 dBA. Case: PBT plastic, 94V-0. Wire connection RPM: 3,200. Bearing: Ball Bearing. Protection: Locked Rotor Protected. New Sunon 80 mm x 25mm server grade 12V DC fan with 2 ball bearings (model # EE80251B1-0000-G99 ). Pretty quiet & moves a good amount of air at full speed. Bearing: Dual Ball. RPM Sensor: Yes. Power Connector: 3 pin. SUNON PMD1208PKB1-A (2). 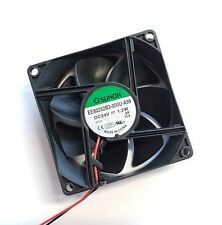 F.GN 80mm x 20mm DC12V 4.7W cooling fan 3 pin 3 wire. Fan Speed: 4600 RPM. Power Connector: 3 Pin. Air Flow (Max): 53 CFM. 80x80x25mm, Ball Bearing Low Speed 2800RPM. SUNON DC F. made by SUNON in Taiwan. CE TUV UL safety. Hope you can understand. For example 3 For example 2 For example 1 . Model Number: SF11580A 1083 HBL. Air Flow: 24-31 CFM. Speed: 2400-2850 rpm. YOU ARE BUYING ONE FAN, 80x25 mm, 12VDC, 2W, SUNON, KD1208PTB2-6OCM, 3 Wire. 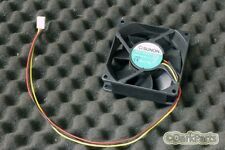 SUNON KD1208PTS1 80mm x 80mm x 25mm Cooling Fan 2Pin. This item is a SUNON KD1208PTS1 cooling fan. Mounting holes distance: approx. 71mm x 71mm x 71mm x 71mm (Center to Center). Two-pin molex connector. Working fan pulled from my stash of dozens of fans I have collected for various projects and never used. I'm downsizing and need to reduce my parts collection. Lot No 9304C. Bearing Type : Vapo. Connector : Small 4Pin (Pictured). Speed : 2000 RPM. Excellent used condition. May have minor scratches. Does not effect the use. Item was carefully pulled, Item is lightly used and 100% working. Item Condition. Sunon Type KD1208PTB1-6 12 VDC 2.6W Cooling Fan by Sunon. Product Depth 80mm. Product Length 80mm. Category DC Fan. Bearings Ball Fan. Two wire (red and Black ) on 110mm lead to 2 way molex plug. Maximum Pressure 0.23inH2O. 25mm ADDA AD0205MB- K50 5v 0.9a microfan. 40mm SUNON 12v 3pin Mag Lev CASE FAN Housing. 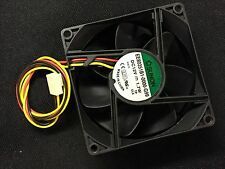 80mm FOXCONN 12v 3pin Brushless CASE FAN. SUNON Cooling Fan MF80381V1-D000-M99 12V 6.1W 8CM 8038 80x80x38mm 3.2"x3.2"x1.5"
Big are flow and ball bearing type. Bearing Type ball. neutral or. Rate (item arrived). Other Countries. Airflow 35CFM±10%. Connector 2 wire. Cable Length 20cm. Rate (item arrived). Other Countries. Sunon 80mm x 25mm 3Pin Case Fan. Item has been pulled from salvage machine so expect the item to be in a used condition with minor scuffs etc. There are only 4 MARs in the United Kingdom. P/N: MPH011000. Item has been pulled from salvage machine so expect the item to be in a used condition with minor scuffs etc. There are only 4 MARs in the United Kingdom. FAN SUNON 80MM/12V/0.13A. Refurbished and Tested. · Warranty covers any hardware defects under normal use during the warranty period. If the sticker is removed warranty is void. This item is covered with 1 month warranty. 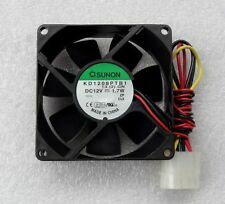 Sunon KD1208PTS4 80mm x 25mm Fan DC12V 1.0W 3-Pin 3-Wire. Condition: Used and in V good condition. Quantity: 1pc. It will be more convenient to both you and us. Manufacturers' Model Number:KD1208PTB1. Cheques (Subject to Clearance). Marke SUNON. Spannung 24V. Type of bearing: Bearings. Fan type: DC. Minimum insulation resistance at 500V DC: 10MOhm. Drive: brushless DC motor. Fan air Duch sentence: 56.05 m3 / h. Cable length: 300mm. 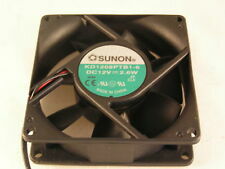 New Sunon 80 mm x 25mm server grade 12V DC fan with 2 ball bearings (model # KD1208PTB1 ). Pretty quiet & moves a good amount of air at full speed. MPN KD1208PTB1. Model KD1208PTB1. Bearing: Dual Ball. 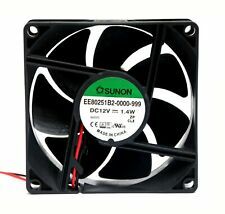 New Sunon 80 mm x 25mm server grade 12V DC fan with 2 ball bearings (model # EE80251B1-0000-G99 ). Pretty quiet & moves a good amount of air at full speed. Bearing: Dual Ball. Bearing Type Dual Ball. 12VDC, 2.5W, RFE, Lot of 24. Custom Bundle No. Power Connection 2-Pin. Type Cooling Fan. UPC Does not apply. Location: 9101A-3. Lot of 5 wew Sunon 80 mm x 25mm server grade 12V DC fans with 2 ball bearings (model # KD1208PTB1 ). Pretty quiet & move a good amount of air at full speed. MPN KD1208PTB1. Model KD1208PTB1. Bearing: Dual Ball.